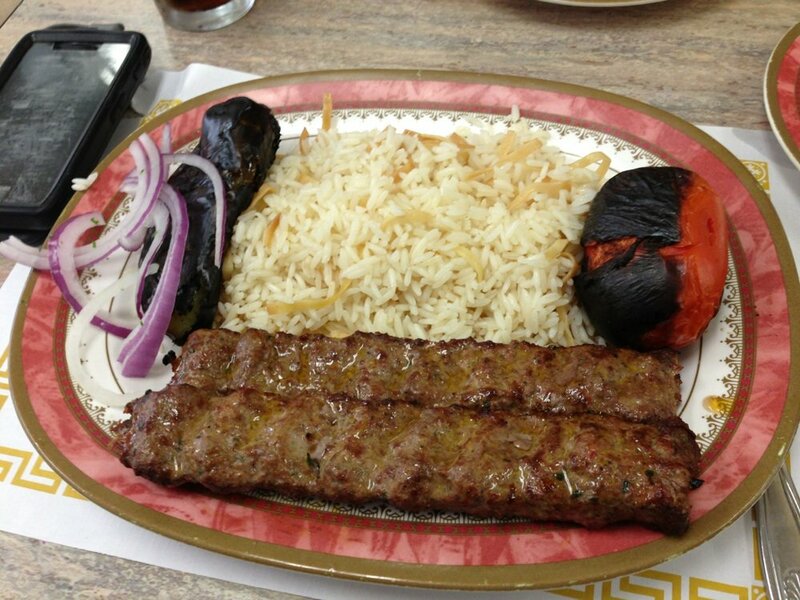 Based in a city with a large Armenian population, the Golden Skewer offers Montebello a welcoming dine-in experience with a mix of excellent and traditional cuisine. A family owned establishment, Golden Skewer offers great food and service that immediately makes customers feel welcome and special. From the complimentary pita bread at the beginning of every meal, to the staff’s willingness to explain the finer points of their menu, the restaurant offers one thing many places lack: attention to detail. The restaurant’s menu includes traditional appetizers, entrees, and refreshments. Appetizers range from traditional Armenian Ikra, a dip made of onions, roasted eggplant, red bell peppers, and spices, to the Greek salad, which contains cucumbers, feta cheese, green peppers, onions, romaine lettuce, tomatoes, mixed with lemon juice and olive oil. Most appetizers are served in large, shareable quantities. All of the Golden Skewer entrée selections are served with roasted vegetables and a choice of a side dish. Entree standouts include the beef kebab, lamb chops and flame broiled Australian lamb. Each entree can be served with a choice of either Armenian pilaf, Basmati rice, French fries, mashed potatoes, salad or soup. Golden Skewer also offers a variety of pita bread sandwiches, such as the falafel burger, salmon burger, and the luleh, a sandwich with the choice of either beef or chicken. Each sandwiches includes a choice of any side item, including the soup of the day, which is prepared from scratch daily. Besides serving a wide selection of expected soft drinks, Golden Skewer also offers Armenian coffee, iced teas, mineral water and yogurt water. To top off an already exceptional meal, the restaurant serves complimentary traditional Armenian deserts, such as gata, a sweet doughy pastry. The restaurant also offers take-out, catering for all occasions and a rentable banquet hall. Golden Skewer is located on 2212 W. Beverly Blvd., and is open Tuesday through Thursday from 11 a.m. to 8:30 p.m., Friday and Saturday from 11 a.m. to 9 p.m. and Sunday from 11 a.m. to 8 p.m. More information and the full menu is available at, goldenskewer.com or by calling (323).727-2952.